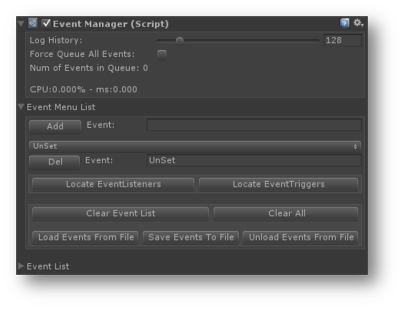 The event manager component is responsible for managing the list of events as well as the flow of events between the game and the fabric components. NOTE: EventManager component needs to be located in the same game object as the Fabric Manager component. Fabric will automatically add it at runtime if one is not available but it will not be possible to store the event list. The event with the name entered is added into the list. The event is deleted from the list.